You know how you’re able to see that someone has “seen” your message on Facebook? 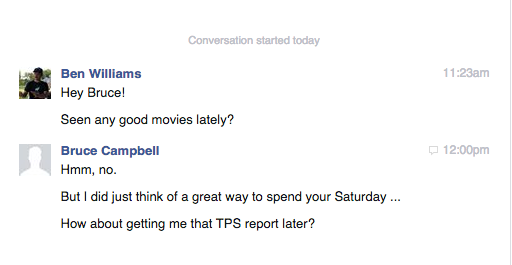 If you’ve ever wanted others not to be informed about when/if you’ve read their Facebook messages, Adblock Plus has a new solution for you. Just click HERE (and then click Add) to enable it automatically; read on for an explanation. But what if you don’t want them to know you’ve read their message? Why? Well, to use the example above, let’s just say that Bruce is my boss. And it’s Saturday. Maybe in response to my innocent question he thinks of something I should do, and instead of responding with helpful film hints he asks me to work. 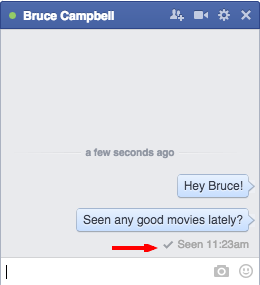 Notice that Bruce above does not see that I’ve read his message – but I have! So I can go out and watch a new flick and Bruce is none the wiser. Nifty, eh? Unfortunately this filters also have an impact on your Messenger App. With this filter set, you dont get push notifications anymore on your iPhone. And when you read them on your Desktop, it still shows it as unread Message on your phone. Nice filter, but too involved in the whole technology. Could you please forward this link to ADP 2.6.6 developers? It is about upcoming FireFox 37, currently, “Nightly” (pre-alpha), ceasing to record history (links/visits) with ADP 2.6.6 enabled while in “e10s” mode.